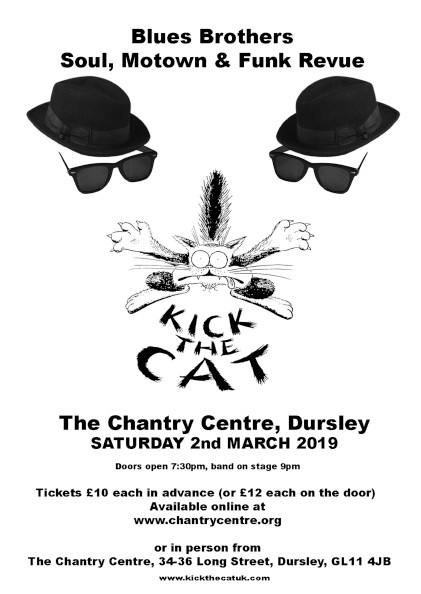 The Chantry Centre, on Saturday 2 March, will play host to one of the most popular show bands in the South West – Kick The Cat. Kick The Cat is an eight-piece band playing a fantastic mix of soul, rhythm & blues, disco, Motown and funk – and are widely known for their tribute to the Blue Brothers. The band has played at the Chantry Centre a number of times and the response is always fantastic - those of you who came last time will know what a great night out it is, as this entertaining band will make you want to get up and dance.